UPDATED: Thu., Jan. 18, 2018, 11:05 p.m. The plan was simple – get inside and rough up the big guys. “That was just the plan, to go at them,” Gonzaga forward Killian Tillie said. Gonzaga took on one of the toughest offenses in the nation on Thursday when the Bulldogs welcomed Saint Mary’s to town. 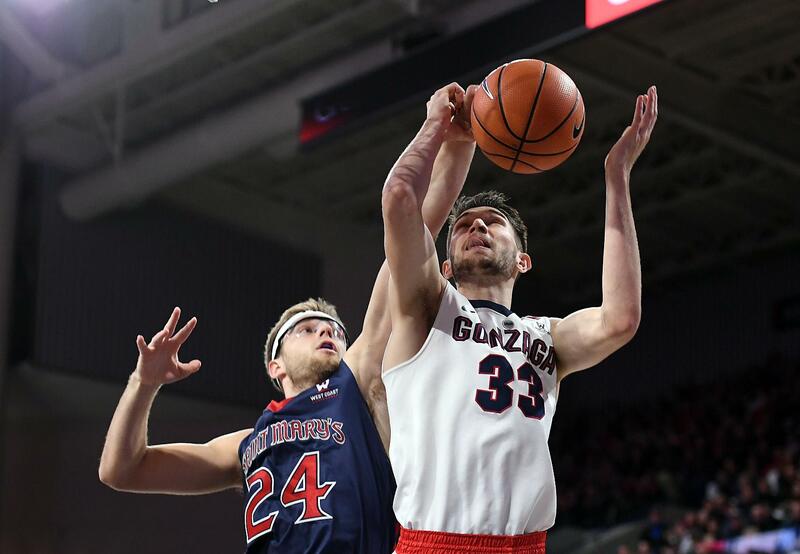 Gonzaga was put up against 6-foot-11, 255-pound center Jock Landale, who overwhelmed the Zags with his game-high 26 points and 12 boards that led the Gaels to a 74-71 upset victory. The Zags quickly turned to their bigs to collapse on Landale and force tough shots in the paint. Rui Hachimura and Johnathan Williams lit up the stat sheet with a combined 36 points and four blocks, but it was Tillie who seemed to be the spark in the opening minutes of each half. The Zags struggled in the first few minutes of the game against Landale, who shook up Williams at the rim. Tillie got the Bulldogs on the board with a pair of makes at the line. Nearly five minutes into the game, the 6-foot-10 sophomore fought through Landale and found an open spot near the rim. Gonzaga guard Josh Perkins tossed the ball up and Tillie corralled it with one hand before laying it in to put the Zags ahead 11-10. Just 20 seconds later Tillie was at it again. He swiped the ball from Saint Mary’s and broke away for an easy layup on the other end, putting the Zags ahead by three. Down the stretch, Tillie made a feisty reappearance. He stepped outside of his usual grounds for a much-needed 3 at the top of the arc just after the half to give Gonzaga a 45-38 lead. Moments later he shook off a crowd of defenders and fought for the ball in the corner to gain a second offensive possession for the Zags. The Gaels pushed him to the edge of the court and stole the ball back on a blind pass toward the back of the arc. Tillie finished the night just behind Williams with 11 points on 4-of-5 shooting in 25 minutes and had a team-high eight rebounds. Tillie was a silent threat on defense, rotating between Landale and the guards. He put pressure on one of the Gaels’ top shooters, Emmett Naar, and helped hold him to just two makes from the field. Tillie also took on Landale, who missed only three of his 15 shots from the floor, in the first few minutes of the game before Williams took over for the rest of the night. Published: Jan. 18, 2018, 10:16 p.m. Updated: Jan. 18, 2018, 11:05 p.m.